TMM are finding plenty of anecdotal evidence these days from positioning in BRL forwards, AUD and other carry currencies and, conversely, the amount of effort central banks and governments in these countries are putting into vain efforts to slow appreciation here. To wit, look at the efforts of Brazil here, South Africa’s towel throwing here, to say nothing of Korea, Japan and the Panda in the room, China. to the short side now this kind of navel gazing doesn’t appear to have an obvious resolution: leaning against the CBs makes a lot of sense and while the equities aren’t cheap so long as you aren’t limit long exporters you won’t have to come into work one Monday, see “Plaza II” on your screens and have 15% of your book facing a world in which their FX is 15% higher and their net income margins just went negative in perpetuity. To that end, TMM are holding off a bit on the anti-bubble trade obvious positions and going for slightly more subtle and less volatile crosses – short AUDSGD, short EURCHF are a lot less hair raising than USD crosses for now. However, we have found one corner of the market that has now conclusively jumped the shark – rare earth metals. 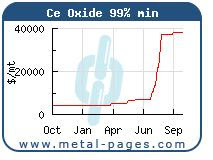 Rare earth metals have been covered extensively elsewhere, but a wiki is not a bad place to start. The long and the short of this market is this: these elements are crucial in a number of applications for which they make up almost none of the cost. As a result, demand is pretty inelastic and buyers will take what they can for what they can and are not all that fussed about pricing, hence the market is very much a supply side driven game. Hitachi has the patent on neodymium-boron magnets which are used for just about everything and which require neodymium, a rare earth metal. In an effort to move more manufacturing for high-tech products to China and probably due to no small amount of Japan bear-baiting China has restricted exports of these products. The only problem with this trade is this: if prices stay even vaguely close to these levels for an extended period of time then every single prospective mine in this space WILL get built. Additionally, after the Chinese experience it seems that end users of these products are very much inclined to throw in the towel on buying at spot and instead vertically integrate by buying a deposit at an earlier stage of development for less. As most industrial organization and antitrust experts could tell you there isn’t much difference between a monopoly and an oligopoly in terms of pricing especially when their cash costs are much the same. You might not get cut off, but you will get gouged. To that end, TMM are calling out those who value these companies assuming current spot metal prices for what they are: idiots. The mother of all squeezes for physical in this space does not translate to permanently higher prices and while there are no futures or ETFs for these metals those piling into LYC and the like are asking for trouble. TMM’s informal poll of the Asian metals and equities trader space finds this position to not be incredibly crowded with a large number of momentum monkeys and not the kind of guys you like to see in these trades, i.e,. - the guys who trade physical. TMM instead prefers to play the takeout game and judging by recent price action in the likes of Greenland Minerals and Energy, we aren’t far from wrong. Big deposit held by junior in need of funding is a much better story than big deposit held by funded mid cap that is already in development for the likes of Hitachi. As we go to press, China have offered another of their pre-G20 offerings with a rate rise. Now we may not see this do anything more than give them a negotiating feather, considering its effect on commodities and Chinese shares, it may just be enough to help us deflate the rare earth metals bubble. China tightening is a bit of a catalyst. I actually expected more reaction, see if there is some follow through. 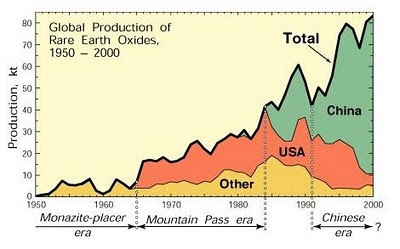 Rare earths sure look a lot like bulk dry shipping in 2007-2008. Stock rises may go on longer than expected, but a quick look at DRYS's chart highlights what will happen when people pay too much attention to spot pricing. Shipments now blocked to US and Europe.